The study of the natural environment, geography deals with the diverse physical, biological, and cultural features of the Earth's surface and examines how humans interact with it. World geography is an important topic for everyone. It can be used to study the past but is also crucial to understanding the events and current political conditions of the modern world. Encyclopedia of World Geography is an authoritative three-volume set profiling everything from the Fulda Gap to the Hudson River. Approximately 750 entries describe pioneers in geography and mapmaking; regions, boundaries, and places; and tools and terminology of geography and cartography. This accessible resource includes appendixes, such as world rankings and a complete world atlas, and almost 200 maps and photographs. Some 100 scholars and experts in the field contributed entries to the text, and a senior academic served as editor. 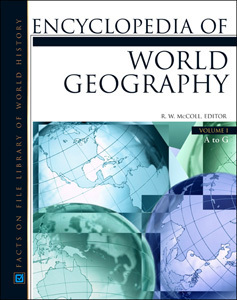 An invaluable reference, Encyclopedia of World Geography is a complete and comprehensive guide to the history and practice of geography and cartography. "The attractive format will appeal to students who need a brief yet informative and current overview of a person, place, or thing related to geography...This very useful and scholarly reference set will be most welcome in secondary school libraries. Highly Recommended." "How often do you really want to read a book about geography for pleasure? The almost chatty style of this encyclopedia may change your attitude!...a marvelous set that most school, academic, and public libraries will need in their collections." "An excellent reference [that] promises both wide accessibility and lasting, relevant information in a highly readable set." "...recommended for public, school, and undergraduate libraries." "This is a reference resource rich in information."